Good that sometimewoodworker put you on the mark. I was a couple of days to late getting the replies, having now gone back to work now. I was searching the same light type for my new fence, to no avail. My only difference is that I am searching the same modern style light but with a solar panel, LED lamp and inbuilt auto night switch. I as I am trying not to run cable. Didn't see those type of light by any chance, or , what brand did you buy, i'll send the GF in to check it out if they may have them. To be honest, no I didn’t see any. The shop is an old school electrical wholesaler full of dusty boxes. An old chap (owner I think) grabbed me as soon as I walked in, I showed him a picture of what I wanted & he pointed to one just like it in the rafters. Not really a display just some open boxes. Granddaughter (I think) was then brought over & she could speak reasonable English & we organised the order. 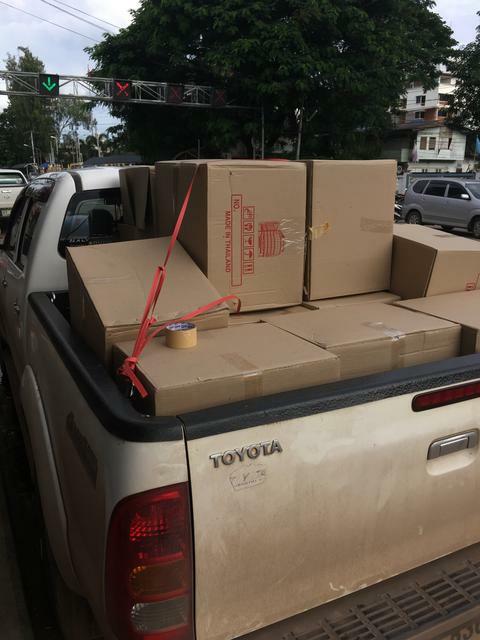 There was a constant flow of Thai chaps coming in buying consumables which they seemed to have everything for but I guess bulkier stuff gets ordered in. There were 4 desks with ladies constantly on the phones while I was there & granddaughter instructed one to find out answers to my questions which was done swiftly. I’ve gone for slightly larger lights to the one in stock for the sides & rear then bigger again for the front. They were very good in recommending what type of bulbs would be best for me. I'll send the girl in one day and she has a photo off the net of the types I want. Hope to get a good result like yourself. Luckily I’d already sourced my lights as they only seem to stock the gaudy ornate ones as do the rest of the home improvement stores. Trip 1. Making light work of this.